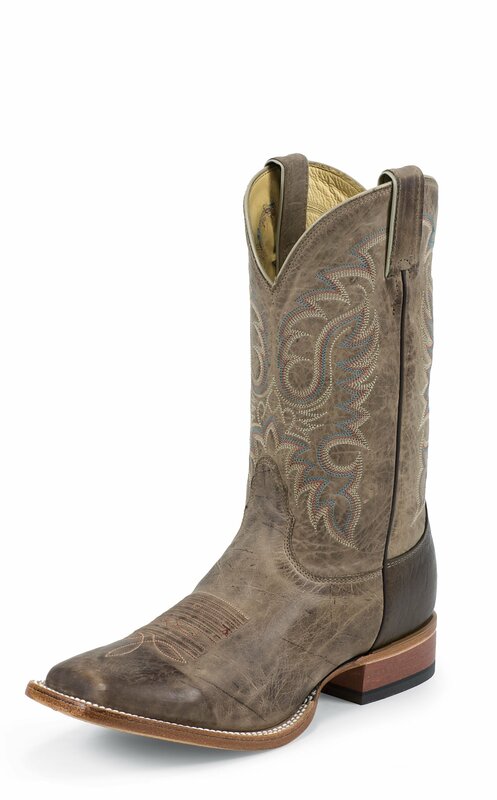 Stir things up in the stirrup with the Ryman 11-inch tall Men's cowboy boot. Its distressed and weathered exterior gives the light brown leather a vintage feel and is accented by a teal and cream stitching and smooth brown leather panel on the heel. This classic boot features a double stitch welt for added durability and a square toe and unit heel allow for an easy fit in the saddle. The cushioned insole guarantees lasting comfort no matter how rough the ride. This style is proudly Made in the USA with global parts. Bought these boots December 2012. I have had them resoled twice. I have Ariat and Justin boots that are about 6 months to 1 year newer (I know Justin is same brand). I've used these boots for field work, through snow, in the rain, through mud, to go out, holiday parties, even a wedding. No exaggeration, even to this day, I get a compliment on my boots approx 20% of the time.Early on, I put an OLD tennis shoe insole in the boot because I got them slightly larger. This tightened it up perfectly. I have walked all over Vegas for 3 days, walked through NY for a day, walked miles in downtown Seattle and many other long walk trips. For a couple years, this is the only shoe I wore whenever I wore pants!The only reason I'm writing a review is because I came online to buy another pair. The current pair I have, finally broke down. The thin brown trim that travels up the sides, cracked and broke. I crouch down a lot for work and it tends to bend the boot down from the top. Also, *cough, when using the restroom... Anyways, this boot outshines my other boots hands down. I can literally sit here and think of at least 25 specific times when this boot has exceeded my expectations. I recommend it, to say the least.